Adaptor not available anymore since Nov 2000 ! The Greek Parallel <-> Ethernet Pocket Adaptor project has been succesfull. It allows you to connect a K.Y.E. Genius E3000 II-2 pocket adaptor to the cartridge port of a ST or TT, and Falcon. To be precise you should be able to connect any parallel pocket adaptor that is based on a RealTek 8002 and 8012 ethernet controller. However there still are some problems with Falcons equiped with accelerator boards. This is due to the cartridge port device. The K.Y.E. Genius E3000 II-2 is a PC pocket-ethernet-adaptor that you can connect on the parallel port. It is almost a small rectangle, with one side a little bigger than the parallel port. And the side it has another parallel connector for parallel throughput. It has a power supply that is connected by a small jack. They have BNC connectors (thin coax) and RJ-45 connectors for 10Base-T UTP. The price is around 70 euro. Because the parallel port of the atari isn't bidirectional, it requires an extra device so you can connect the K.Y.E. Genius E3000 II-2 to the cardridge port. This device do you have to build yourself. 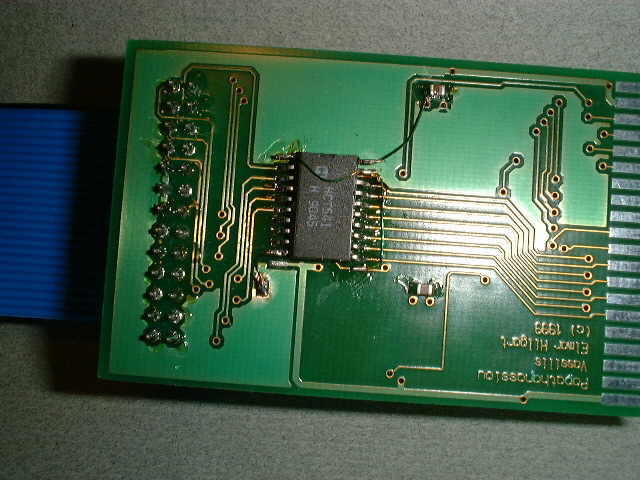 RTL_8bit.gif : circuit-plan cartridge port device. ether_pa.zip : the driver (compiled) and cartridge port device shemes. The adaptor connects the cartridge port to the K.Y.E. Genius E3000 II-2. It is a very simple circuit with 3 ICs. Printed Circuit Board diagrams in Scooter PCB format are available in the last mentioned package. However when looking at them you must note that the second 74LS374 is not part of the board, in fact on Vassilis' own PCB it's piggy backed on the first 74LS374. Thus they share pins 1 and 10 (GND) and pin 20 (+5V). All other pins are on the air except pin 11 (small wire to ROM3) and six wires to get the needed signals (A13 -> AUTOFD, A14 -> RESET and A15 -> SELECTIN). It's not very nice, but it keeps the PCB very small and SCOOTER's autorouter happy. Address line 8 (A8) going to D0 in the parallel port is not an error. It simulates the missing A0 line of the ROM port, that's why there is a lookup table in the software. Normally we could use LDS/UDS for that, but Vassilis' tests showed strange results between different Atari models (ST/TT/Falcon), thus this strange solution. Of course you can ask Elmar Hilgart one of his prefabricated devices. They look and are very proffesional. This device also has 3 ICs and some other pasive elements. Elmar doesn't use the same ICs as Vassilis. Please report any changes to the diagram/board (or possible errors) to Vassilis Papathanssiou. If any of you has an idea for a bidirectional design, or better yet an EPP board, we will be happy to hear from you.